The Istituto dei Mestieri d’Eccellenza LVMH carries on the transmission of savoir-faire in artisanal and retail skills, expanding its presence in Italy with three new partnerships. The Istituto dei Mestieri d’Eccellenza LVMH (IME) vocational training program has marked the beginning of a second year with a ceremony at the Palazzo Pucci in Florence. The event welcomed IME apprentices from across Italy (classes of 2017/2018 and 2018/2019) as well as representatives of partner schools and LVMH Maisons. The LVMH Institut des Métiers d’Excellence was created in Paris in 2014 to promote, transmit and valorize savoir-faire in artisanal, creative and retail skills for the luxury industry. After just two years the IME expanded to Switzerland in 2016, inaugurating the École d’Horlogerie LVMH. In 2017 the IME brought the program to Italy, based at the Palazzo Pucci in Florence, launching two training programs: leather goods craftsmanship at Polimoda in the Tuscany region, and another in jewelry with For.Al in the Piedmont region. “LVMH clearly recognizes the importance and excellence of Italian savoir-faire. The development of our Institut des Métiers d’Excellence in Italy reflects the Group’s commitment to playing an active role in training young people and developing job opportunities available to them,” said Chantal Gaemperle, LVMH Executive Vice President of Human Resources and Synergies. In retail with Università Ca’ Foscari Venezia, which offes a “Master in Luxury, Customer Advisor” Taught entirely in English, the program has been developed by the Ca’ Foscari Challenge School and is funded by the Venetia region. These new training programs join those that were successfully launched in 2017, bringing to five the number of IME work/study programs offered in Italy. 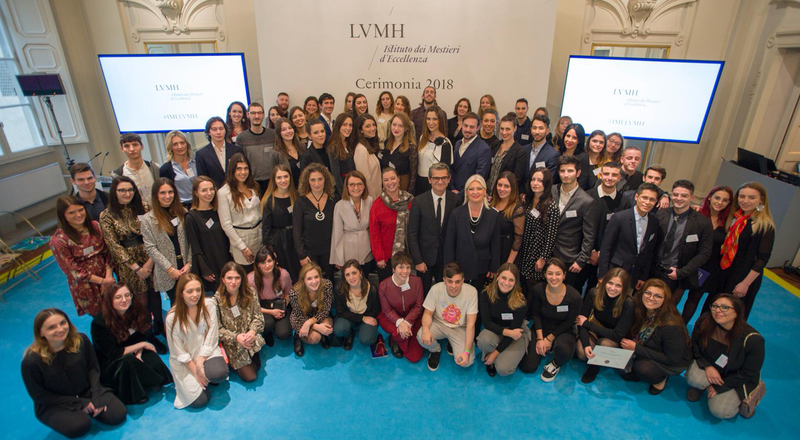 A year after the launch of the Istituto dei Mestieri d’Eccellenza LVMH, the program has proved a resounding success: 100% of the apprentices received their degree, and 93% received the Certificate of Excellence. This certificate recognizes apprentices who demonstrated exemplary professionalism and excellence in both their area of expertise, their soft skills, and their affinity with the luxury industry. Furthermore, the placement rate for these Italian graduates is 88%, either in jobs in the métiers studied, or through ongoing training. Some 63% of the graduates have found jobs at LVMH. Financed by the European Social Fund through Italian regions, these training programs introduce a groundbreaking approach. The apprenticeships combine theoretical classroom training at partner schools with practical experience at LVMH Maisons, plus foreign language training. There are also innovative modules in the form of Master Classes designed by the IME in conjunction with LVMH Maisons. 88% placement rate either in jobs in the métiers studied, or ongoing training. Some 63% of the graduates have found jobs at LVMH (provisional figures). In Switzerland with the École d’Horlogerie LVMH. 80% placement rate either in jobs in the métiers studied, or ongoing training. Some 60% of the graduates have found jobs at LVMH (provisional figures). Apprentices: students who receive training at both a partner school and at a company within the framework of the IME program.